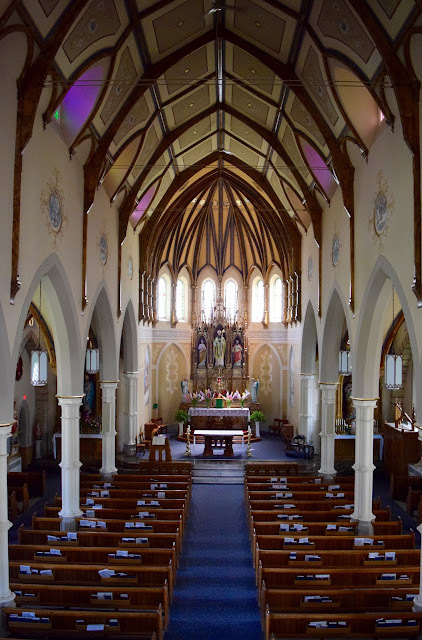 They had … faith and they built for it, places of worship which were temples of the spirit, social centres of the growing communities and, all too frequently, the only buildings in which they could afford the luxury of beautiful space. It would be an irreparable mistake to let buildings which played so vital a role in the social history of the province disappear without record or comment. Churches, places of worship — for the preservationist another weighty topic, right? So let’s ease into it. 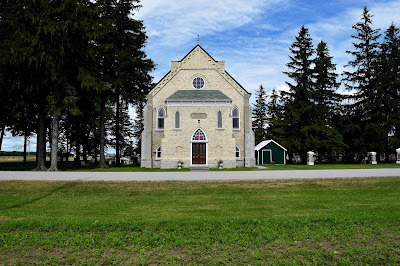 I’ll start by taking you on a little pictorial tour of three country churches in this part of the world (Perth County). Unlike many, these churches — or at least the buildings — seem to be doing just fine. 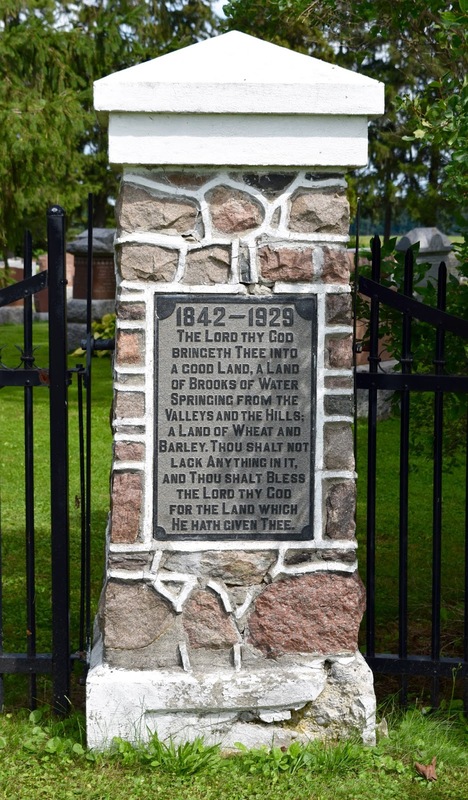 One of my favourites, this little church is in a tiny place called Avonbank (not to be confused with nearby Avonton, and certainly not Avonlea!). Constructed in 1890 as a Presbyterian church, it has a quiet simplicity and grace. Its congregation long ago combined with that of Motherwell Presbyterian, a few miles away, and the building today is used rarely — for one annual service, a candlelight carol celebration at Christmas and for the odd wedding or special event. But, as you see, it is well-maintained and someone has planted the flower pots beside the door. The adjacent cemetery has four very handsome fieldstone gateposts. 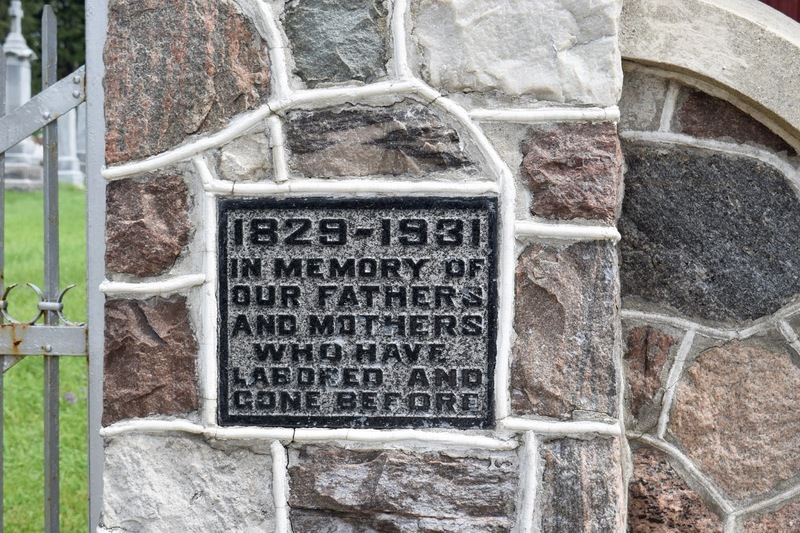 These are from 1929, which seems to have been a time, in these parts at least, when the second and third generations began to publicly commemorate the achievements of their settler forbears. 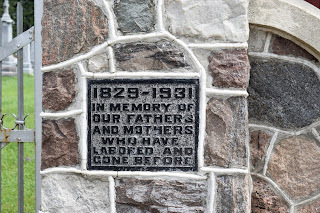 The sentiments this evoked are beautifully captured on plaques on two of the gateposts. 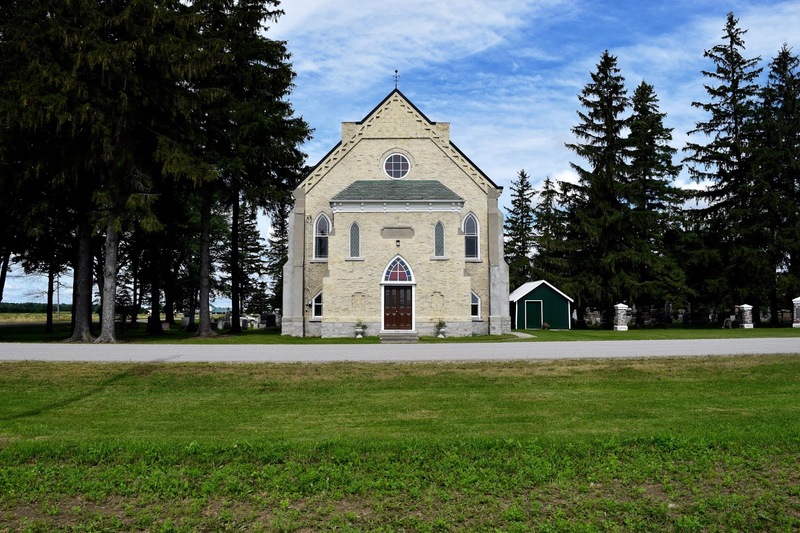 Several miles to the north, on Highway 8 — the old Huron Road — is Seebach’s Hill and First St. John’s Lutheran Church. The church, built in 1927, replaced earlier ones on the site. It too has a cemetery (special to me because my Schneider great-grandparents are buried there). 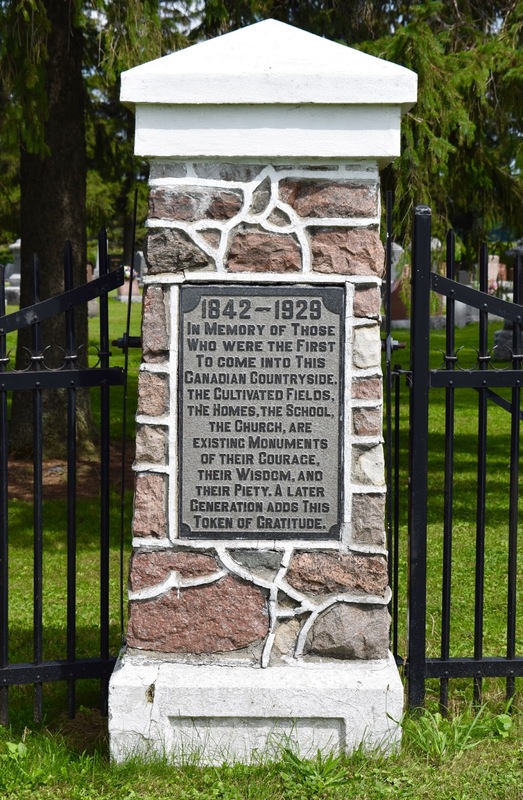 Note that the cemetery entrance, visible to the right, has very similar fieldstone gateposts to Avonbank’s — the same craftsman? — this time with the date 1931. 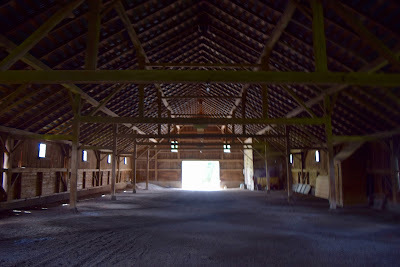 But the really remarkable thing about Seebach’s Hill is the church’s old buggy barn. I have never seen one like it. The huge barn — 260 by 54 feet! — clearly belonged to the old church but has somehow survived and become… a car barn. How many other rural churches do you know that have covered parking? And, by the way, is this still religious heritage or something else? Is this a case of adaptive re-use or just continued use accommodating changing technology? 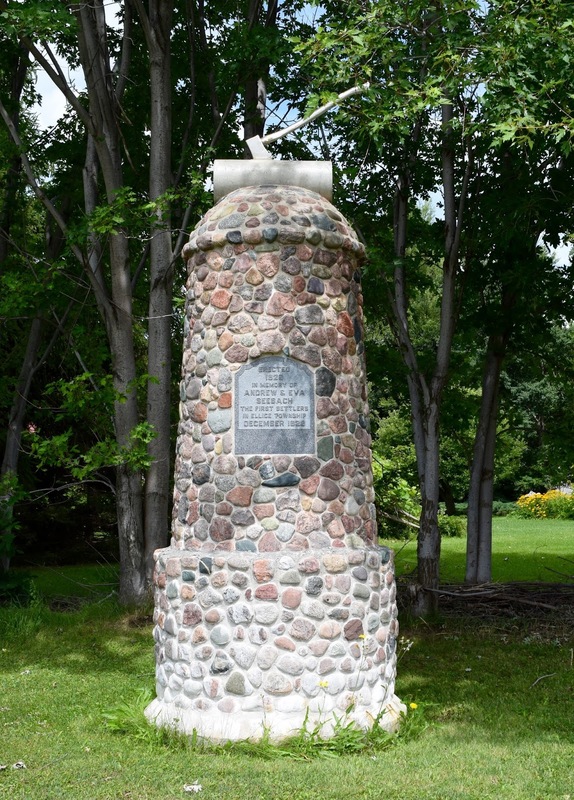 Just up the road, on the way to our last stop in Kinkora, we’ll stop to admire the striking circular cairn to Andrew and Eva Seebach. Seebach — like Sebastian Fryfogel, who built the iconic Fryfogel Tavern to the east of Stratford — had one of the early settler inns on the Huron Road. 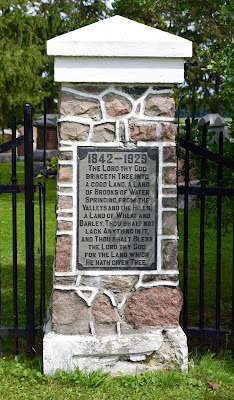 Mmmn… more fieldstone work, dated 1928, the centenary of the opening of the Huron Road and the Seebachs’ arrival here. A couple miles north, almost lost in the cornfields, is the quiet hamlet of Kinkora — in Gaelic Kinkora means “place of beauty.” While the Roman Catholic church here is, not surprisingly, St. Patrick’s, what is surprising is the grandeur of the church. It’s a stunner! 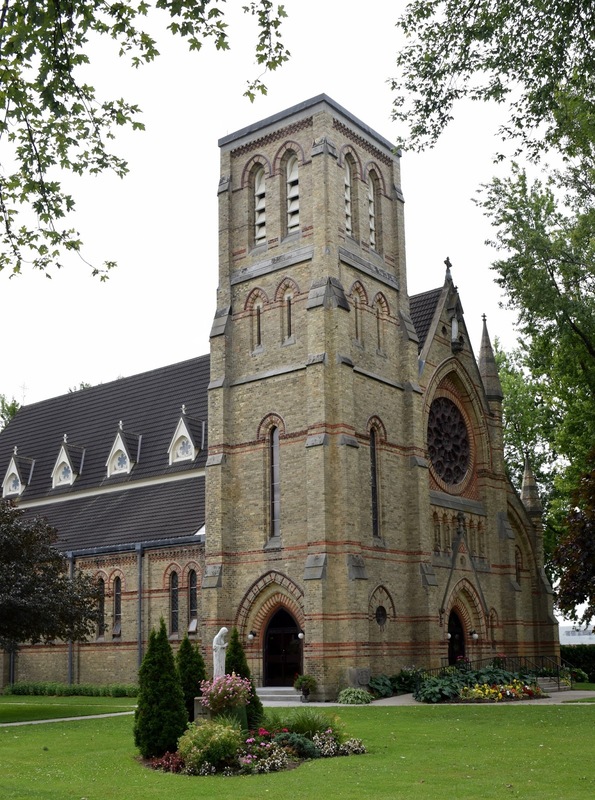 The church, from 1882, is in fact the work of noted Ontario ecclesiastical architect Joseph Connolly. 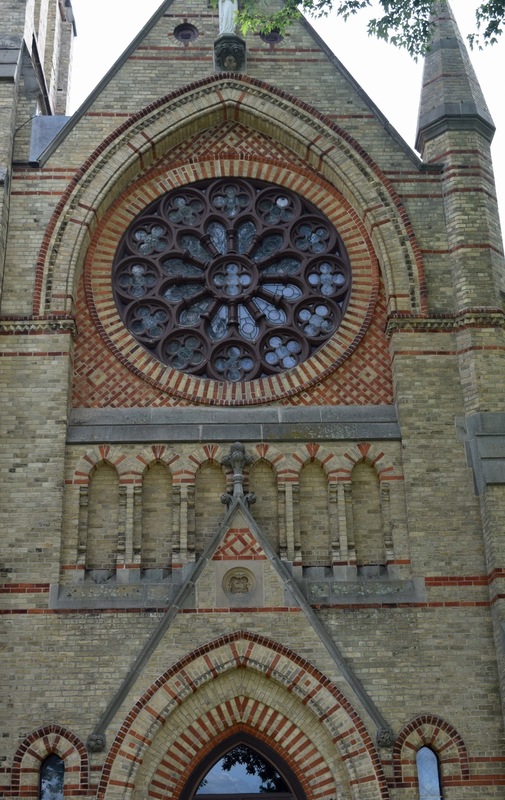 Connolly is perhaps best known for the majestic Basilica of Our Lady Immaculate that dominates downtown Guelph. How the local Irish farming community managed to lure Connolly to this unlikely spot — and pay for this sumptuous building — is a story I have yet to discover. Unlike the limestone Guelph church, Kinkora is of brick, in polychromatic High Victorian Gothic. 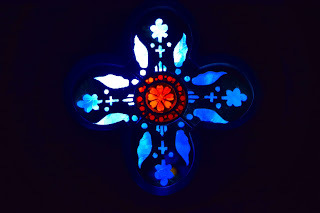 The interior is sublime and and the building has a very pretty separate side chapel. Alas, the spire on the tower, visible for miles across these flatlands, had to be taken down a decade or so ago, although there are hopes it may be reconstructed. 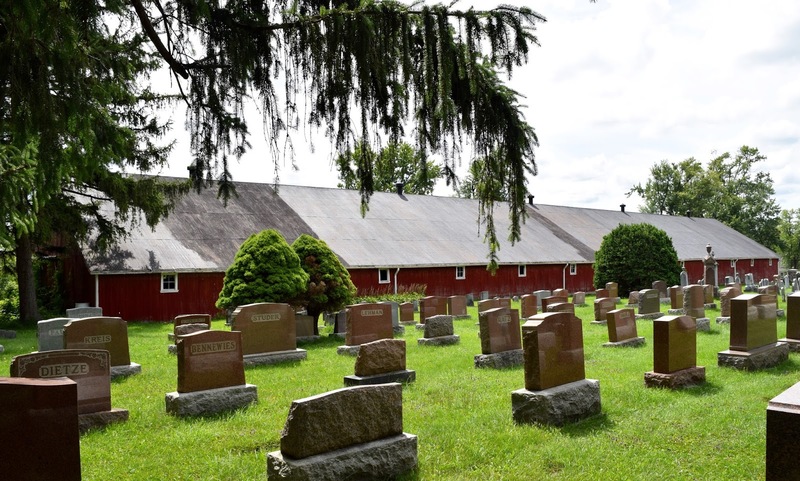 These three churches — and their associated cemeteries, gates and buggy barns — are lucky to survive and continue to be lovingly preserved by their communities. 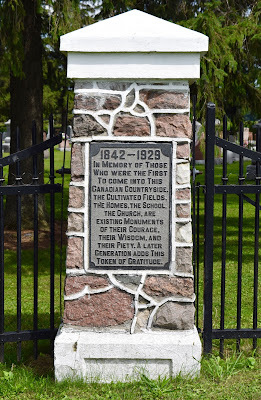 None is listed or designated under the Ontario Heritage Act. Should they be? Of course — we’ll get into this and more thoughts on the protection and preservation of religious heritage next time. By the way… thanks for reading! Visiting many churches and cathedrals in Europe has given me a new appreciation for the beauty of these buildings in our area. As you mentioned, the thought of a small town coming together with limited resources and creating something so lovely is really overwhelming. 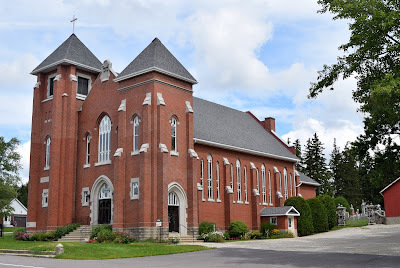 They are all so beautiful but my favourites are often the smaller and more humble structures such as the Avonbank church or the Eden Mills church, which feel warm and welcoming.